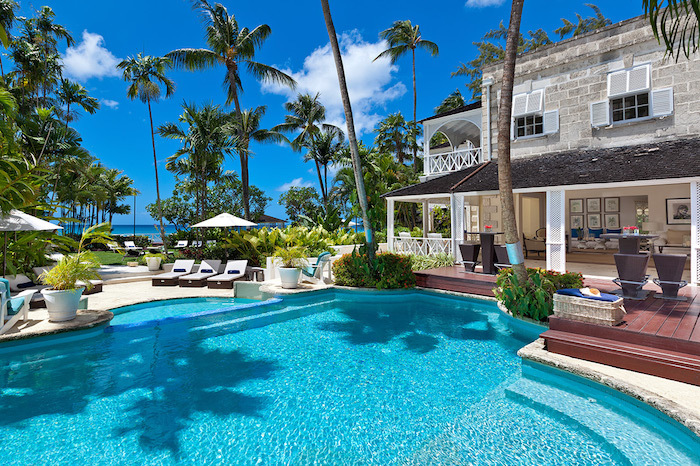 Leamington Pavilion is an opulent beachfront villa set within two acres of lush, tropical gardens, and provides a magical setting ideal for families or groups looking for a more personalised holiday alternative to the larger hotels on the island. The timeless essence of Leamington’s sophisticated yet unpretentious elegance is reminiscent of its past, when famed movie stars Greta Garbo and Claudette Colbert dined under the Caribbean stars, and glamour juxtaposed effortlessly with relaxed island-style living. Leamington’s meticulous décor blends luxurious furnishings, noteworthy antiques and personalised touches to make the villa truly one of a kind. The villa is filled with European and Caribbean-inspired artwork, including paintings, sculptures and hand-painted furniture, as well as artisanal finishes such as sculpted cornices and coral stone archways. While Leamington is replete with architectural and design interest, intrinsically it is a home. The main salon, located at the centre of the villa, opens onto a large covered terrace with casual dining and living areas, suitable for entertaining large groups and parties, yet cozy enough for a more intimate get together. Dark wicker furniture, overstuffed white pillows and billowing curtains create a breezy atmosphere ideal for outdoor living, one of the most enticing features of a Caribbean holiday villa. There is also a separate formal dining room, decorated in the Rococo style, featuring classical statues in corner niches framed by shells and coral, surrounding a stunning marble dining table with an antiqued mirrored top. Flowering trellises adorn the entrance ways, creating a romantic atmosphere ideal for candlelit dining on cool Caribbean nights. Beyond the main terrace is the villa’s classically shaped swimming pool, where crystal waters entice guests for early morning laps, midday dips to escape from the heat of the sun and evening soaks beneath the stars. Emerald green lawns flank the pool where chaise lounges await sunbathers, as well as two enchanting gazebos designed by famed local architect, Larry Warren. The dining gazebo is ideal for casual dining or afternoon tea, while the other features an oversized lounger, inviting chats with friends over a round of rum punches, catching up on the latest novel or sneaking in an afternoon nap. Leamington’s four air-conditioned bedrooms feature charming décor, fine-quality linens and hand-painted furnishings, enhanced by warm lighting, unique artwork and ample yet cozy space for private relaxation. Each features a spacious, en suite marble bathroom, exquisitely decorated with crystal chandeliers, floor-to-ceiling curtains and luxurious linens. Two of the guest rooms are located in one wing off the main salon, while a third guest bedroom and the luxurious master suite, featuring a stunning canopied bed, are located in another more recently built wing designed by Larry Warren. The master bedroom opens onto a trellised sitting area with comfortable seating, a flat-screen television and flowering vines, not to mention stunning views of the manicured gardens and swimming pool. Two of the bedrooms feature cable TV. Beyond the enchanting surroundings and luxurious amenities, perhaps one of the most alluring features of your stay at Leamington is the five-star service provided by the villa’s experienced staff: There is a butler, housekeeper, chef, maid, gardener, night watchman and dedicated property manager on hand to ensure your comfort; it is their objective that you thoroughly enjoy every moment of your holiday from start to finish, leaving with memories to last a lifetime. While the serene setting and luxurious pampering of the Leamington estate can make one feel miles away from the island’s pulsing lifestyle, its location near both historic Speightstown and vibrant Holetown, offers easy access to shopping, fine dining, charming beachfront cafes and vibrant nightlife. Leamington Cottage, set just at the water’s edge, can be rented in conjunction with the main house should an additional bedroom be needed. Note: Children welcomed by special request. No smoking is permitted indoors. Leamington Pavilion is a beachfront home. It should be noted that our beaches are constantly changing their shape and size mainly as a response to seasonal waves, currents and tides. Every effort has been made to depict the beach in front of this property, but temporary changes may occur. 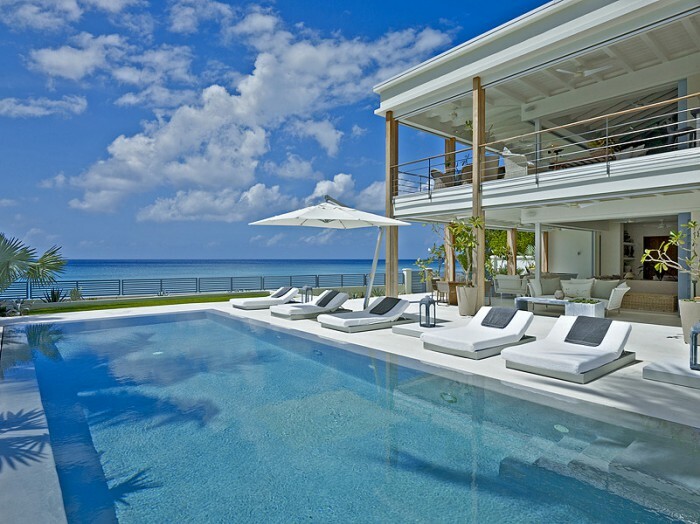 This stunning home features a contemporary ultra modern design with a blend of Caribbean chic that embodies comfort and tranquility. Huge panoramic windows open right up to take full advantage of the spectacular views. Each room encompasses indoor/outdoor living whilst maintaining privacy.